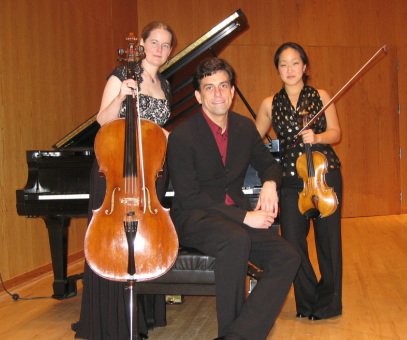 The Remy-Lee-Cooley Trio gave their first performances in 2006 at the University of Central Oklahoma, where cellist Tess Remy-Schumacher is on the faculty. Since then, they have performed at the University of Minnesota-Minneapolis; Minnesota State University-Moorhead; Longy School of Music, Cambridge, MA; St. Leo’s College, Tampa, FL; University of Arkansas-Little Rock; and the Phillips Academy in Andover, MA, where violinist Judith Lee is on the faculty. They have given master classes at UCO, UALR, and Blake High School for the Performing Arts in Tampa, and have been featured on WUSF Radio and WTSP TV, both in Tampa. Their CD, featuring trios by Tchaikovsky and Beethoven, is available for download on cdbaby.com. Listen to tracks from our CD online at cdbaby.com.